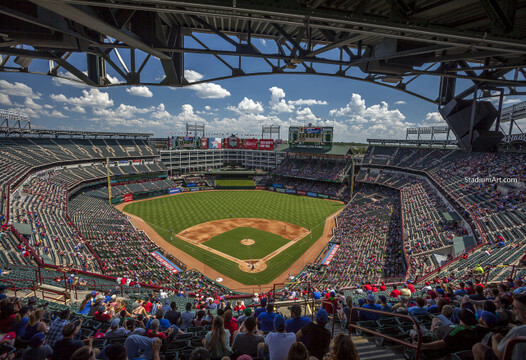 Texas Rangers play baseball in Globe Life Park in Arlington Texas. Previous baseball stadiums include Arlington Stadium, RFK Stadium and Griffith Stadium. Globe Life Park was originally called The Ballpark in Arlington then Ameriquest Field to Rangers Ballpark in Arlington. Legends of the Texas Rangers include Nolan Ryan. The fine art photos are available in various sizes including 11x14 photo, 13x19 print, 8x10 image and 40x30 canvas frame.